Happy weekend to you! 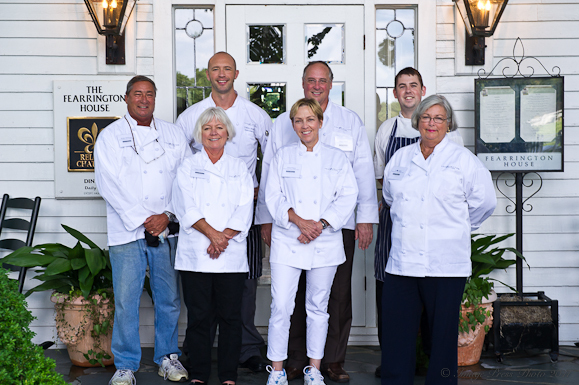 If you read my last post about Fearrington House Inn and Restaurant, you will know that we traveled to this lovely Relais & Chateaux property outside of Chapel Hill, North Carolina to attend one of their Culinary Retreats and Cooking Classes in August. 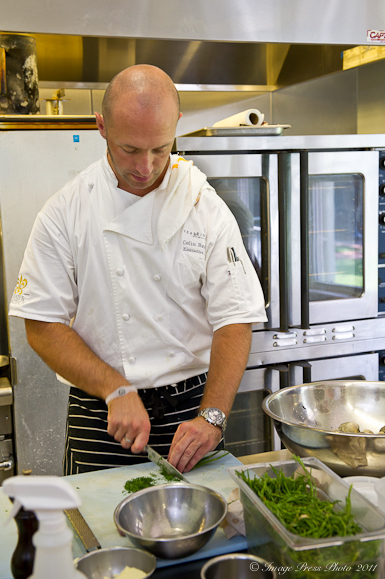 I was excited to be able to work with Chef Bedford in the kitchen. His formal culinary training was in England. He also worked at a Michelin Star restaurant in the UK before leaving to pursue his career on this continent (more on that next week). The food that we had experienced at dinner at the Fearrington House Inn the evening prior to the class was truly exceptional. The presentation of the dishes was beautiful and the flavors outstanding. I have to admit that I have missed dishes that are prepared with this level of technique and sophistication. While I enjoy using and preparing fresh and local ingredients in a simple manner, I have found that many restaurants are now preparing food that is less complicated and often times, less than exciting. Technique is still important in preparing great food, regardless of whether it is local or not. We go out for dinner primarily to have a meal that either has ingredients that I cannot get or am not able (or willing) to prepare at home. That will usually involve dishes that are more creative and more time consuming to prepare. 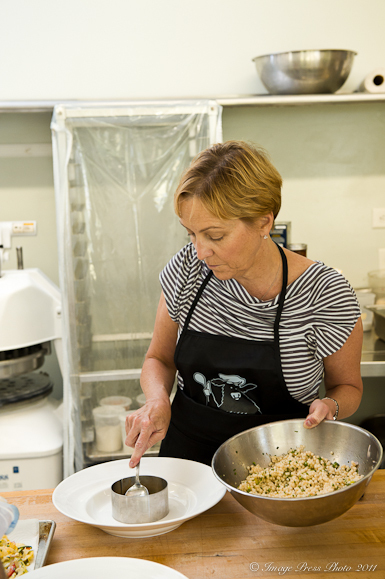 It is about the quality of the ingredients, but in addition, it is also about the technique in preparing them. 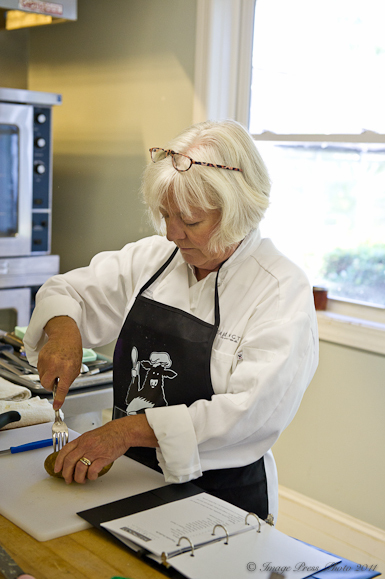 No matter how much you think you know in the kitchen, you can always learn something from talented chefs. I took away quite a bit of knowledge and some very helpful hints from this cooking class that will definitely enhance my culinary skills at home. 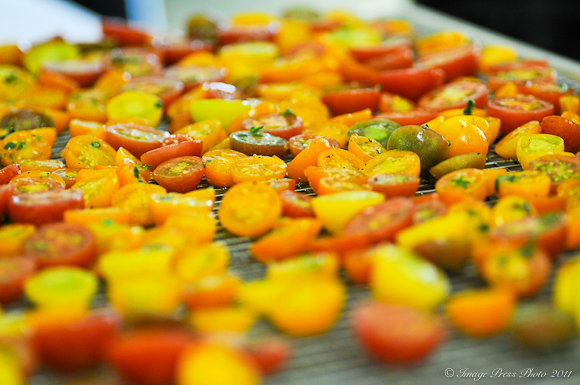 I also think that you become inspired and empowered when you work with chefs in their kitchen. 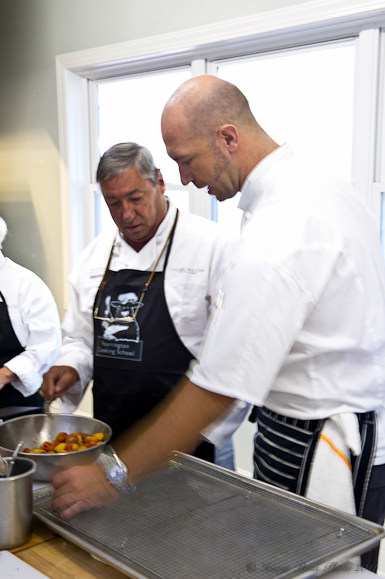 It is how most chefs learn to do what they do; they train with other chefs. Oh love this recipe and the class seems great fun. 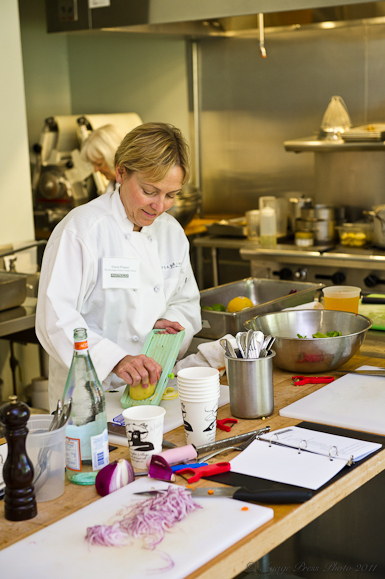 I used to assist in some culinary boot camps at CIA and it was always fun to meet new people that were so enthusiastic about food! Great times! You look like a graduate of Le Cordon Bleu in that first photo! What an incredible cooking class, and soup! Looks pretty involved, but, as you said, I’m sure it would knock my socks off. I was feeling pretty much like a culinary school graduate after that class. It was an intensive one day class, but we had so much fun and learned so much. The dishes we created were very special. I was quite excited to learn some great techniques from this very talented chef and there will be more to come form this trip! Terrific post! The soup makes me hope to find some fresh corn, I was thinking about substitution of frozen, thinking I could make it again when fresh corn is readily available. The corn stock stopped me. I’m going to see if I can find some fresh corn. Sounds well worth the effort. Definitely use fresh corn. You will need the cobs to make the stock. We actually freeze the cobs after scraping the kernels from them in case we want them for stock in the winter. Yes, this was a wonderful dish. I love the combination of flavors and textures. We had so much fun attending this class. 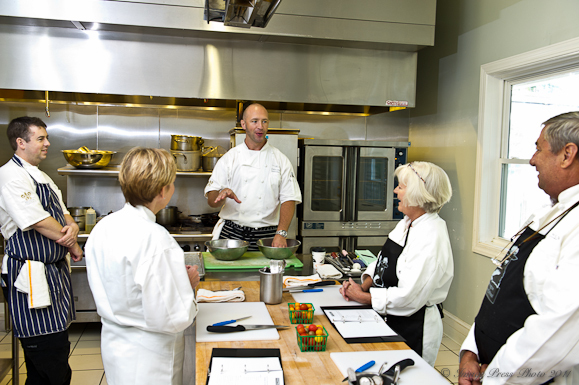 Chef Bedford is an excellent instructor and a very talented chef. Woww!! What a great cooking experience! I wish I had been there! So happy I dropped by to check in what have you been up to Gwen. Looks like such a fun experience!! 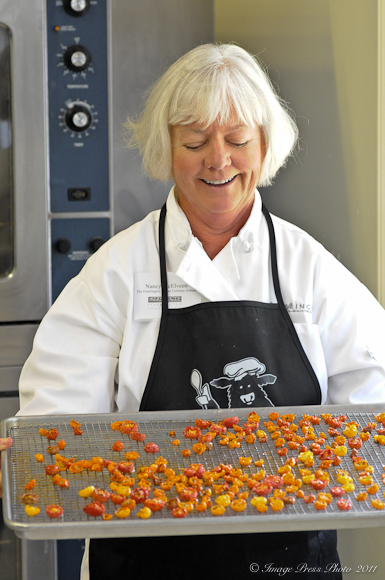 Great recap of your culinary adventure! Gwen, you have done a great job capturing the fun and the skills that made this a wonderful and unique food experience. That man with the camera is pretty skilled also. 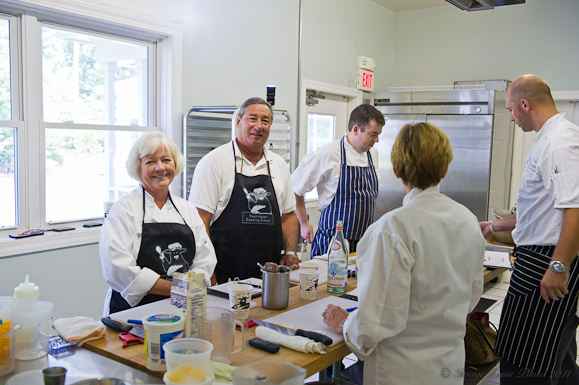 Nancy and I Hope to share another cooking class with you both very soon. On The Road culinary adventures goes to Kentucky!